USDA's Natural Resources Conservation Service is taking to the skies to review Conservation Compliance. Working with experience pilots, teams of federal conservationists will conduct aerial conservation compliance reviews on 635 sites in 40 counties in northwest and southwest Iowa this month. Teams of federal conservation experts, partnering with experienced pilots, will conduct aerial conservation compliance reviews on 635 sites in nearly 40 counties in northwest and southwest Iowa this month. The 1985 Farm Bill requires the USDA-Natural Resources Conservation to check a random sampling of highly erodible fields each year to ensure farmers are following the provisions in their conservation plans. Conservation compliance is required for maintaining eligibility for USDA programs. Status reviews in the remaining 60 counties in Iowa will be conducted on the ground. "Other states have been using aerial surveys to save time and resources for several years," says NRCS state conservationist Richard Sims. "We here in Iowa are implementing this pilot project to see if we can increase our efficiencies and effectiveness while maintaining accuracy and fairness." If the project is successful, NRCS may chose to implement the strategy statewide, he says. Teams on the ground will verify the accuracy of the aerial status reviews that find farmers out of compliance. NRCS offices sent notification letters to all producers and landowners with fields the agency will review aerially. Planes will be flying at lower altitudes, about 500 feet, to allow conservationists to visually evaluate tillage use, crop residue levels, conservation practices in place, the presence of ephemeral gullies and other key compliance factors. Farmers who are not following a conservation system or who drain wetlands could be found out of compliance and risk losing USDA benefits. The soil is prepared, the seeds are planted, but plants are not very tall and the ground is not protected very well from falling raindrops or flowing water. This is the time of year when erosion risk is the highest. It is for this time period that there has been a focus on reducing tillage and retaining crop residue. "I think that the early part of each growing season is the best time for farmers to evaluate their operations for conservation practice effectiveness on their farms," says Joel DeJong, an Iowa State University Extension field agronomist in northwest Iowa. "We will need this land farmed in a century, and I believe it is part of our job to be certain we keep it in shape for that to occur. The soils we farm, the slope that occurs in our fields, and rainfall events (intensity, duration, amount) all change that risk. Some farmers have a lot more erosion risk than other farmers on the acres they farm." There is a web page called the Iowa Daily Erosion Project, at http://wepp.mesonet.agron.iastate.edu/. Under the erosion tab you can look at individual days, months, or even years where erosion estimates are calculated. The model for these erosion estimates is the Water Erosion Prediction Project (WEPP) model. A number of assumptons are used to calculate these predictions, including soil types, rainfall amounts and other data are used for this website. "Looking at the site for May 11, 2011, you see some interesting information," says DeJong. 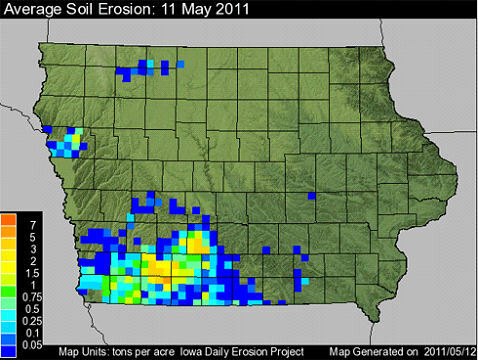 "A few areas of Iowa had heavy rain that day and it looks to me like one of the counties in west central Iowa averaged over a ton/acre soil loss that day. A township or two in SW Iowa lost an average of 5 to 7 tons per acre on May 11, if this model is right. That's a lot of soil loss for a sngle day, I think." Erosion doesn't occur every day, of course. But it can be tremendous on some days when rain is heavy and comes down fast. It varies a lot from year to year, too. "The 2006 year doesn't look too bad.," he says. "A year with more rain, like 2009, looks like we experienced a lot more erosion. Go to the webpage and put in different dates to see what occurred. Take a look — it will make you think!" The Iowa Daily Erosion Project resulted from discussions by Rick Cruse, an ISU professor of soil management, and John Laflen, a retired USDA Agricultural Research Service ag engineer. Soil erosion by water only occurs during storms that produce runoff and is thus a temporally and spatially dynamic process. To help visualize the process, Cruse and Laflen came up with the The Iowa Daily Erosion Project, a daily simulation of the erosion process on nearly 20,000 hill slopes across the state of Iowa. The project was implemented through the collaboration of scientists from ISU, University of Iowa and USDA's ARS National Soil Erosion Research Laboratory and the National Laboratory for Agriculture and the Environment at Ames. The process was peer reviewed and published in the January/February 2006 issue of the Journal of Soil and Water Conservation.